When someone is being independent, they are living a life mainly dependent on no one but themselves a life with not much help from anyone. Those who are independent get to live a life with more freedoms than someone who seems to be living a life full of dependency on others. In order for a person to be independent they must be mentally strong, and willing to overcome struggles and tough situations without the help of others. An independent person is a person who is confident in themselves, and a person who plans out carefully the goals and dreams that they want to and will pursue in their lifetime. A person who is being independent is a self-starter because they realize that if they do not sow the seeds of hard work, they will never receive any rewards or harvest from not doing so, and they will essentially starve. 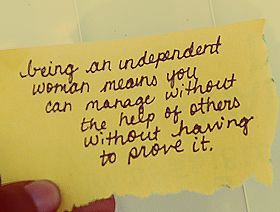 Being independent requires a sound mind, a strong will, and the determination to never quit no matter what may lie in your way.